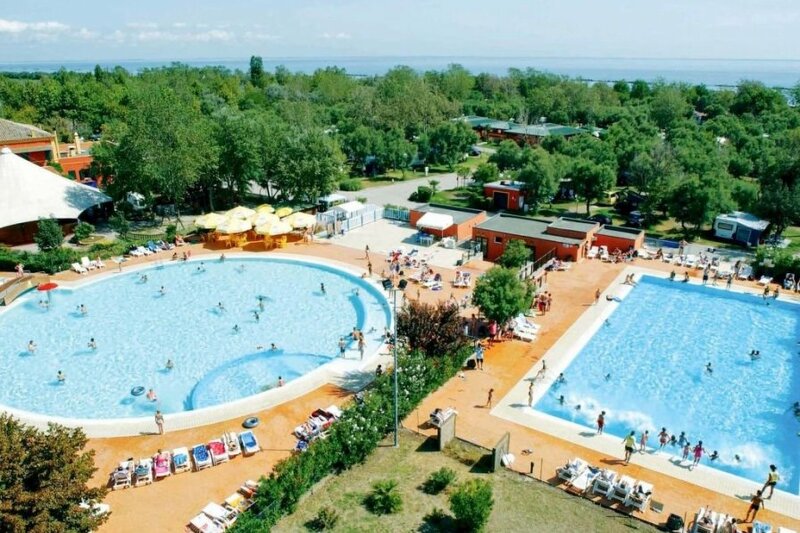 This 2 bedroom apartment is located in Lido di Pomposa-Lido degli Scacchi and sleeps 6 people. Mobile home, 4 - 6 people, 3 room/s, 2 bedroom/s, 1 bathroom/s, approximately 25 m², 1 floor/s, access to the property via external stairs. The owner does not accept any youth groups. Feature: Property on a campsite (210 units in total). Equipment: air conditioning (in the living room); electric radiator. Final cleaning by tenants. Holiday resort tax. Linen/towels must be brought along. Bed linen available on loan, € 15 per single bed/​change, € 20 per double bed/​change (on order). Deposit € 100 (in cash). Cot only within the maximum occupancy, € 2 per day (on request). High chair/​Baby bath each € 2 per day (on request). Pet not allowed. Access/parking: at night and around noon no access to the complex for cars. Estate (shared use with holiday guests): approximately 13 ha, closed plot, trees, lawn. Pool (shared use): 25.0 x 12.5 m, 1.70 m deep, 19/05/19-16/09/19. Pool area: sun loungers (payment), sunshades (included), external shower, WC. Pool 2 (shared use): 600 m², 0.90 - 1.20 m deep, 19/05/19-16/09/19, curved shape. Pool area: sun loungers (payment), sunshades (included). Pool 3 (shared use): 100 m², 0.40 m deep, 19/05/19-16/09/19, children's pool. Sports facilities/ leisure time: shared use (free of charge): beach volleyball, multi-purpose sports track, table tennis table, children's playing equipment. Entertainment: included: evening events, sport animation (approximately mid May until mid September). Day care: included: animation for children, children's club (approximately mid May until mid September). Infrastructure: reception; washing machine (coin-operated); dryer (coin-operated); internet access Wi-Fi (payment) in the reception area. Bar/cafe, restaurant, snack bar, food shop, kiosk. Beach service: at the beach (15/05/19-09/09/19): deck chairs, sun loungers, sunshades (payment/on order). Plot description: 1 x parking on the estate; parking outside the holiday complex (payment). Terrace 9 m² (partially roofed, wood terrace), furnishing provided, 2 sun loungers, barbecue. The agent describes this apartment as a family friendly holiday rental ideal for the summer holidays. It is also good value for money. This apartment is located in Lido di Pomposa-Lido degli Scacchi. The nearest airport is 104km away. It is set in a very convenient location, just 0 metres away from a beach and only 1.2km away from the city center. The apartment has free wireless internet. The apartment is adequately equipped: it has air conditioning and a washing machine. It also has a BBQ. The apartment is suitable for family friendly summer holidays as well as relaxing winter holidays.